I realize that I am preaching directly to you with this note since those about whom I’ll write couldn’t care less. From you, dear choir, what I will ask is your righteous indignation and to give no quarter to these individuals. They will either rise or fall on their own merit into a bed of their own making somewhere outside of the privilege and responsibility of caring for patients in need. The Dude can no longer abide. Going into a new facility, speaking with clinicians, and reading their notes has me crawling out of my skin. Observing a clinician day after day providing the same chair exercises and copying/pasting notes is at best lazy and at worst sniffing the foul odor of waste and abuse. Why does Medicare have all those rules again? Let me illustrate the issue a little more clearly. 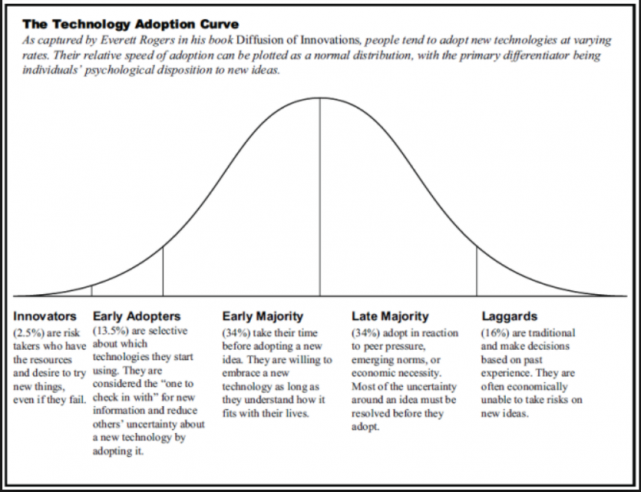 Most folks are aware of the Technology Adoption Curve (fig. 1). The Innovators are positioned to the front-end extreme followed by Early Adopters, Early Majority, Late Majority, and Laggards. To note, the Laggards tend to “make decisions based on their own past experience and are often unable to take risks on new ideas. I propose that the very same curve which has helped to identify the technology-customer and explain how new tech has been so effectively integrated into our society is also applicable in similar proportions as in service industries. This absolutely includes healthcare. However, the implications of not purchasing the newest edition of the iPhone are vastly different than the potential dangers of practicing physical therapy, medicine, dentistry, etc… the same way and with the same “experience” we collectively had 30, 20, or even 10 years ago. I propose that being a Laggard and purporting to be a professional clinician are simply incompatible and unacceptable.